I have a hard time believing I was just in New York City yesterday, teaching two workshops for the Big Apple Knitting Guild. I wish I had pictures to show of that great group, but I failed to take even one! What was I thinking? In order to be in the city first thing Saturday morning, I took the train late Friday. I had just enough time to meet a friend downtown to visit Amy Routman’s pop-up show “People and Clothes” in Chelsea. You may have seen her work featured on Mason Dixon Knitting. She paints with such a delicate affection in her watercolors, and I share her taste in color and what I would call whimsy. I recognized so many of her subjects, people and particular runway moments from the recent shows, clothes I had seized upon myself, for their inventiveness or plain old appeal; I felt like I just met a kindred spirit. I wish I could tell you there’s time to catch the show, but it was a brief Brigadoon moment, alas. If you follow her on Instagram, I am certain she will signal another opportunity to catch her work in person before too long. Afterwards, my friend and I walked the Highline on our way to dinner. That was the one thing all weekend I managed to photograph. 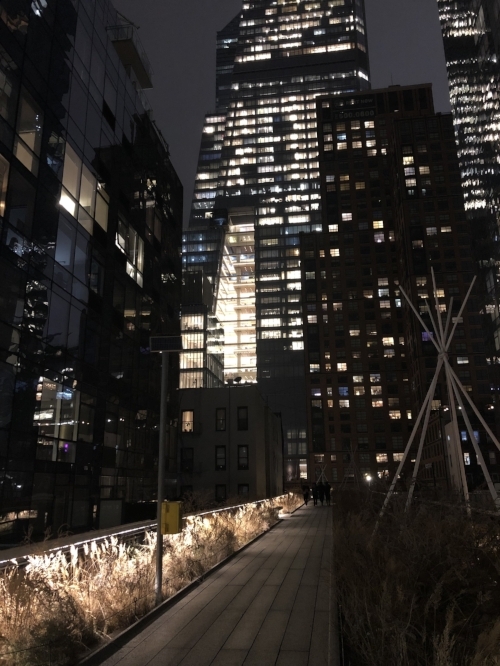 I’d never seen the Highline at night before, so that was a treat. Even in the drizzle of late November, we felt elegant and charmed to be there. And speaking of charmed, I was up early to meet the BAKG knitters, a cheerful and engaged group even on a bleary Saturday morning. Even though they meet in Manhattan, they draw their members from north, south, and east of the city. We knit argyle and Prada Shell swatches together, and I showed them a few things they weren’t expecting. That’s always the fun part, the little surprises of teaching, when you get to offer something essential to someone’s skill set for the first time, and the shared ah-hah of when they get it. This never gets tired. So what is the Announcement promised in the post title? One of my next teaching opportunities has just been announced, so I can share that I will be joining Fiona Ellis, Susan B. Anderson, Patty Lyons, Nicki Epstein, and Michelle Hunter at Webs’ first Spring Retreat, May 2-5, 2019. Click through for more details. I’ll be introducing a new Combination Knitting class, as well as Finishing, Intarsia, and a crowd favorite, Steeks for the Timid. Webs has a dedicated shopping spree session for weekend attendees and the food is also pretty darn good. Maybe you can join us there? There are a few other things coming along in the spring, but I’ve been sworn to secrecy for now.